1. When was the first time you visited Albania? September 23, 2012. I remember this day very clearly because it ended up being one of my favorite travel moments ever. 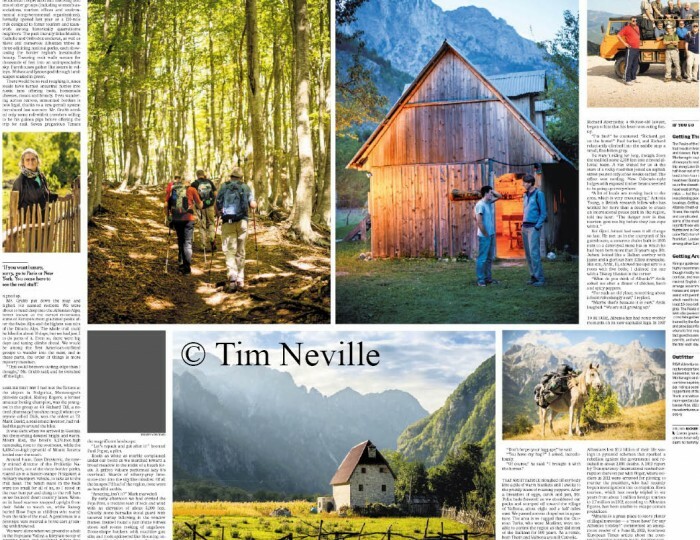 I was with a group of Americans on a guided hiking trip along portions of the Peaks of the Balkans Trail and we walked over the mountains from Gusinje—or Gucia—to Theth. The alpine scenery was unforgettable, the sky so big and the meadows so green. After I saw some of Hoxha’s infamous bunkers, I really felt like we were doing something that not very many people had ever been allowed to do. (The permit system that allowed us to walk over an unguarded border point was also very, very new). We walked into Theth at night, checked into a stone guesthouse and stayed up late drinking brandy and talking with the owner by candlelight. We ate farmer cheese and crispy goat. It was fairytale and I could not understand how so few international travelers had ever heard about this place. I knew right then and there that I had “discovered” a truly special place and that I should come back. 2. Why do you think that our country is so special if you have visited half of the world? It’s true, I have been to many, many countries now — maybe 70?—and oftentimes people in places that are relatively new to tourism can’t understand why in the world a foreigner would want to come to their country. But Albania is something different. Your country is tiny but has so much diversity—from sparkling beaches to towering mountains—and you’re incredibly blessed culturally. You have ruins, ancient villages, modern cities, thrilling adventures, lovely nature, outstanding food and a fascinating, though very difficult history. And coolest of all from a traveler’s perspective, Albania is still figuring itself out. You can feel the changes happening, the clashes between the ancient and the new, the raw and the industrial, at every turn. Albanians are also some of the most welcoming people I’ve ever met. People inviting me into homes, to beers, for dinner: You don't get that in, say, Switzerland, which I also love. Albania is Switzerland before all the money came in. 3. How many times have you visited Albania now? I’ve made three trips there and two to Kosovo. I’m trying to come back again this summer to go fishing. 4. Will there be a next time? Absolutely. The pessimist in me says a place as good as Albania can’t last. There’s no way. Assuming you guys don’t make some very bad decisions or get too greedy, Albania will become a cooler Croatia or a smaller Italy. That is both a good and a bad thing, in my view. It’s good because it will mean more jobs and better standards of living for Albanians and “doing things right” could become a deep source of pride for a people who have suffered enough. But it’s also bad (for me) because the menus will become more expensive, the inns will be more upscale and the tourist path will become well worn. So I want to see it now while it’s still relatively cheap, fresh and untrammeled. One day I will tell my grandchildren “I remember being in Albania when you could travel the whole country and not bump into another American” and they’ll think that’s ridiculous. 5. You are a journalist but you are also a traveler. According to your opinion, what’s the biggest problem of the Albanian tourism? Right now two things: Infrastructure and corruption, and I imagine those two things are related. If you want more tourists to spend more money there you need to protect, restore and defend your natural areas and cultural sites from greedy, short-sighted interests. Your hotels need to be more standardized and the roads improved. You need to get a grip on illegal building or building in areas that should be left open. You need leaders with vision who can resist the urge to better themselves at the expense of others. In short, Albanians need to organize and come up with a strategic plan for developing the tourism sector in a sustainable, cohesive way. I hear this is happening along your coast, which is possibly your most precious asset. But a plan that everyone can get behind is a tough thing because the benefits from such a plan take a long time to materialize. Albanians have already been waiting a very long time. It means increasing your wealth gradually for the long run and not trying to cut corners overnight. I think Albanians in 1997 learned the very hard way what can happen when you try to get rich overnight. You have quality assets that deserve quality treatment. Be patient with them but destroy corruption immediately. 6. And, what’s the strongest point? Albania is like a kitchen with every ingredient for a meal unlike anything anyone has ever tasted. (And I LOVE Albanian food, by the way.) You have all of these elements — nature, culture, activities, history — that are so unique and the people are still trying to find the best ways to cook them. Albania is still relatively unknown. Show people one picture of an amazing Albanian beach or of the mountains around Theth and they won’t believe it is Albania. No one else can really offer a traveler — especially a traveler to Europe! — that sense of discovery. Again, Albanians are also very friendly. Some of the kindest people I met had no clue that I was a writer and had no reason to treat me well. It came from their own hearts. This is extremely touching and the single best thing for Albanian tourism. No one wants to go to an unfriendly or fake-friendly place. 7. Are there special things or special people on your memories that maybe you haven’t had the chance to mention somewhere. You may confess to us. I know that I have a very romantic view of Albania. I also know that a lot of suffering still happens there. On two of my trips to Albania I’ve visited with a politician from the town of Permet, a really great, ambitious, but frustrated guy, who helped explain some of the “real” Albania to me. I’ve never been able to get him into one of my stories but the things he told me are haunting and influence what I write about Albania. His stories about the anarchy that broke out in the 1990s were terrifying. So while Albania has all this potential to be something really great, history suggests it also has the potential to be violent and awful and I worry that a switch could flick at any time. I have sometimes dreamt about owning a small place near a beach or in the mountains where I could bring my family, write, eat “tavë kosi” everyday and learn Albanian, but the security situation needs a longer record of stability to convince me things won’t turn violent again. In the meantime, I’m happy to visit as often as I can. 8. Which country of the world is the most beautiful, if you have one in your mind. This is a tough question because, like people, they’re all so different. As a travel writer, I make it my mission to try to find the beautiful, surprising or unexpected side of places and in this way Albania is a treasure chest. So a lot of my answer would depend on the time of year I visit. I can’t imagine a more beautiful place than Chamonix, France, for icy alpine grandeur in winter. Fiji has beautiful coral reefs. Switzerland’s valleys are sublime in the fall. The light in northern portion of the United States state of New Mexico is exquisite in summer. Argentina’s rivers are world class. I’ll never forget lying in the grasslands of Mongolia without a road or a fence around for a thousand kilometers in any direction. The sky was so big I swear you could feel it sitting on your chest. Albania is high on my list, too. The Osum Canyon with all of those waterfalls raining off of all those cliffs is spectacular. Rafting through that canyon was easily the most dramatic, day-long whitewater rafting I’ve ever done, anywhere. 9. You are almost a hero in Albania for all the articles you have written until now for our country. Can Albanians hope that other articles will be published on NYT of elsewhere about Albania? That’s very kind to say but I am no hero. Everything that’s amazing about your country would still be amazing if I’d never walked across that border in September 2012. I was just lucky enough to see it when I did and to have the means to let others know about it in a big way. But yes, I have other stories about Albania in the oven, though none for the New York Times. 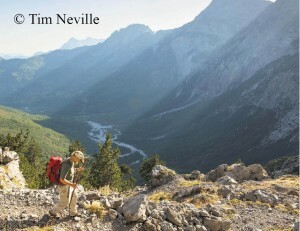 My next one, which I think is my best one, will be coming out in Outside magazine’s June issue. (www.outsideonline.com). Outside is a major magazine in the US with close to 2 million readers, I think. The story is called “Europe has a Secret” and it attempts to introduce active American adventure travelers to Albania. It focuses largely on an Albanian guy who runs an outdoor adventure company based in Tirana, while explaining the history and issues facing the country. It’s a “warts and all” story as we say, meaning, I don’t ignore the ugly. And yet the majority of the piece showcases Albania’s beauty. By combining the ugly realities with the outstanding beauty, the article has an overall message of “hope"- a hope that Albania will realize its potential to become something truly great. If that happens, there’s no doubt who will be the real heroes.